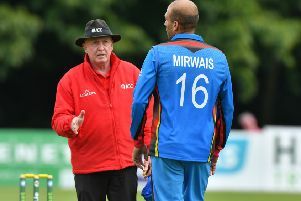 Ex-Ireland Internationals Andrew White (left) and Nigel Jones joined Simon Dyke from Cricket Ireland to make the draw for the semi-finals of the Irish Senior Cup. Holders Waringstown have been handed a home draw against fellow NCU side Instonians in the semi-finals of the Irish Senior Cup following the draw today at Stormont. The match is a repeat of the 2011 final which was won by The Lawn side. The other semi-final is an all-Leinster affair with 2010 winners Merrion having home advantage against YMCA - who have never reached the final of the competition. The games will be played on Saturday August 13th with a reserve date of Sunday August 21.